Conspiracy theories aren't just a feature of the fringe. They've been a potent force across the political spectrum, at the center as well as the extremes, from the colonial era to the present. 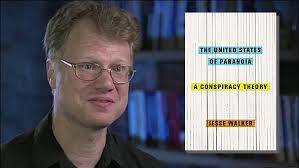 In The United States of Paranoia (HarperCollins, 2013), Jesse Walker explores this rich history, arguing that conspiracy stories should be read not just as claims to be believed or debunked but as folklore. When a tale takes hold, it reveals something true about the anxieties and experiences of those who embrace it, even if the story says nothing true about the objects of the theory itself. In his talk, Walker will lay out five conspiracy narratives that keep recurring in American politics and popular culture. Jesse Walker is an editor at Reason magazine and the author of Rebels on the Air: An Alternative History of Radio in America (New York University Press, 2001). His articles have appeared in The New York Times,The Washington Post, The Wall Street Journal, and many other venues. He lives in Towson, MD with his wife and two daughters. Following the success of the inaugural NCAS SkepTour* in May 2013, the National Capital Area Skeptics continues to compile information to publish in a skeptic's field guide to the area. This isn't just the DC edition of Tobin's Spirit Guide -- we also want to include items with scientific, pseudo-scientific, and cultural significance to skeptics. We are crowd-sourcing this info, and you are invited to help. And on Saturday, May 10 at 1:30 PM (start location and rain date TBD), we will take this to the streets. We will select a few key locations for a walking tour in the downtown DC area. The goal is to have a 2-3 hour leisurely walk, with brief talks along the way. The field guide will be an on-going project, and can include locations across the VA-MD-DC area. For a location to be considered for the May walking tour, we need your input by April 20. After locations are selected, volunteers will be asked to research, prepare BRIEF (< 5 min) presentations and answer questions on the May 10 walk. On March 24, Phil Plait, "The Bad Astronomer," devoted an article on his Bad Astronomy blog at Slate.com to the 2013 NCAS Philip J. Klass Award, which he received for his outstanding contributions in promoting critical thinking and scientific understanding. Plait thanked NCAS, and added, "Being a skeptic is hard, it really is. It’s so much easier to simply accept a warm, fuzzy lie than it is to embrace a cold, sharp-edged truth, and it takes a long, long time to learn how to do it. I’m still on that road, and it’s a rocky one, but I’d rather see the Universe for what it is than what we wish it to be. It’s vast and beautiful and complex and mysterious, and that’s good enough for me." He also included a link to the NCAS YouTube Channel's video of the award presentation, recorded by Stuart Robbins in Boulder, Colorado on February 5, 2014. On behalf of NCAS, astronomer David E. Kaufmann presented the award. Dr. Paul Jaffe, who presented the March 8 NCAS lecture "Evaluating Alternative Sources of Energy: Solar Energy from Space," was interviewed on "MSNBC Live" by anchor Craig Melvin on March 30. During the five-minute segment, Jaffe was able to cover only the basic elements of the topic. MSNBC has posted the interview online. To see Dr. Jaffe's NCAS lecture, visit the NCAS YouTube Channel. Torn From Today's Headlines By Scott Snell. "When I was at the Goddard Space Center a number of years ago, I met creationists and evolutionists who were both working on the Hubble telescope. They agreed on how to build the Hubble telescope. You know what they disagreed on? Well, they disagreed on how to interpret the data the telescope obtained." "I had the opportunity recently to speak at a lunch meeting at NASA’s Goddard Space Center near Baltimore, arranged by the Bible Club there. Over one hundred people attended the meeting, including many scientists. Even though there was some opposition, the overall response was very positive.[...] Perhaps the most thrilling part of this visit was to be taken on a tour by scientists who were both Christians and ardent creationists." "I had to shake my head as I thought of the number of times that evolutionists have claimed that no creationist can be a real scientist. There are probably many more scientists out there who are creationists than we realize!" How can it be that there are (or were) "scientists who [are] ardent creationists" at Goddard? The answer, at least in this case, is that his two tour guides were not scientists...they were engineers. I can vouch for the one I know as a fine and effective engineer. I don't know the extent of his knowledge about the Big Bang in particular or cosmology in general, but that has no bearing on his engineering abilities or his success on the job. If Ham were to use the correct term ("engineers" instead of "scientists"), his story might lose some of its potency, even for a lay audience. Note that Ham didn't use either term in his comment during the Nye debate, describing the Hubble team members only as "creationists and evolutionists who were both working on the Hubble telescope. They agreed on how to build [it]." A careful and knowledgeable listener would conclude that these were engineers, not scientists. But Ham followed with "...they disagreed on how to interpret the data the telescope obtained," which could mislead a listener into thinking the disagreements were among scientists. Two-sentence summary: It is hard to believe so much wrong information could be packed into one hour. But I was there; it can be done. The Grand Canyon is similar to a canyon near Mt. St. Helens, and in 50 years geologists probably can't tell the difference. Real science is making rockets and sending them up into space, but once you try to say something about the past, it's a belief system. There are no transitional fossils, according to Dr. Colin Patterson. Creationists believe in Natural Selection -- that's just not evolution. There may still be dinosaurs existing today, and the only way we'd know for sure is to have observers looking at every square foot of ground on the Earth simultaneously and reporting that they don't see any dinosaurs. Archaeopteryx was a true bird. "Living fossils" indicate that our ideas about the geological column are wrong. The best examples of anthropological evidence for pre-humans are Piltdown Man (a hoax on which 500 Ph.D. theses were written), the Nebraska Man tooth, and skulls of Australopithecus (undiscussed) and Neanderthal man. NASA Viking probes show evidence of a global flood on Mars where there's no liquid water. Yet scientists don't believe in a global flood on Earth where there's plenty of water. COBE [Cosmic Background Explorer] was wrong. The fluctuations COBE saw indicate a degeneration in the fundamental fabric of the Universe, a preliminary indication of the coming "test by fire" promised in the Bible. Fossils only exist in the present, so what can they tell us about the past? We weren't there. Behemoth in Job is a dinosaur because his tail was like a cedar tree, and therefore couldn't have been a hippopotamus or an elephant. Creationists are a minority and the minority is always considered to be wrong. The order of a sequence, like letters taken randomly from a hat, is meaningless unless we have a pre-existing language to interpret the words. The Flood produced most of the fossils found around the world. Dinosaurs existing on the Earth just a few hundred years ago were referred to as dragons. Evolution is at the root of all the social problems found in America today. Even Creationists would expect _some_ change in "living fossils" over 50 million years! It was all quite astonishing and unbelievable. And several parents brought their kids from a nearby Christian school, too. Some members and contacts of NCAS receive a postal notification of this and every new monthly Shadowof a Doubt. The Shadow Light postcard announces the monthly lecture and highlights of the electronicShadow of a Doubt, which is available online at ncas.org/shadow. NCAS thereby reduces Shadowproduction and postage costs. To further reduce costs, members and contacts can opt out of postal notification altogether, while continuing to receive Shadow of a Doubt via e-mail. To opt out, send us an e-mail at ncas@ncas.org.